Welcome To The Wonderful World Of Violin Playing! Hello! Welcome to Violin Journal. This is the place where many of my violin students have proudly embarked on their violin journey as they learn this amazing singing instrument. If you are looking for a violin teacher who is able to draw out the best in you or your child , I looked forward to hearing from you! I offer 1-1 violin lessons, group lessons and special violin programmes in my private studio based on the western part of Singapore. Establish a sincere interest in the art of playing the violin while being grounded in the solid fundamentals of violin techniques that is passed through the generations of violin masters - yet delivered in a modern student centered environment. Achieve a balance of ear training and music theory growth so that your inner ear is sensitive to the nuances of good music and lead you to become a well rounded musician. Remain motivated and finally enjoy a wonderful singing tone from your violin! You will grow in personal awareness and understand that violin playing develops your personal discipline and mental attitudes towards continuous growth. 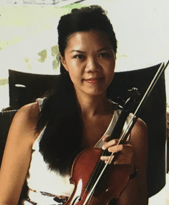 Elaine is a passionate violin teacher teaching from a private studio in the western part of Singapore (Buona Vista, Dover, Clementi, Holland, Queenstown). She has been bringing the joy of learning to play the violin to children and adults since 2005. 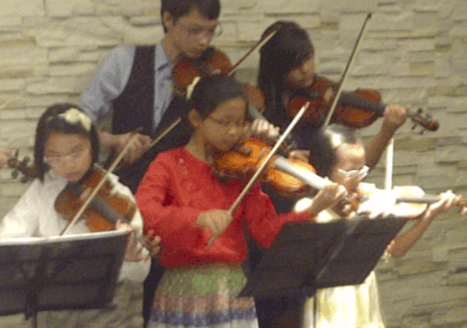 With her patient and student-centered personality, her violin lessons continue to touch the lives of students, enabling each one to see the violin's inner beauty. Click HERE to fill in a enquiry form. "Under her diligent instruction, my children have grown increasingly confident in their ability to play the violin. She has actively worked on cultivating in them the joy of playing the instrument beyond just passing exams. My children have also been accepted into their school's String Ensemble, and are able to hold their own playing with older students at higher competency levels than them..."